Smart bulbs give your smart home setup a bright start by adding ambiance and fine-grained lighting control to any room. Right now, some Philips Hue lighting essentials are on sale on Amazon for cheaper than ever. A four-pack of Philips Hue White A19 dimmable LED smart bulbs is $39.97, down from a list price of $50, and the Philips Hue Smart Dimming Kit is $28, down from a list price of $35. The Hue White A19 bulbs come in a soft white. Once you’ve connected to a Philips Hue bridge ($60 on Amazon), they’ll provide simple control to your lighting system, with scheduling and on/off capabilities available from anywhere using the app. For even more convenience, you’ll also be able to control your lights with your voice. These bulbs have 4.1 stars out of 5 over more than 900 Amazon user reviews, with reviewers noting their easy installation and crisp light as reason to buy. 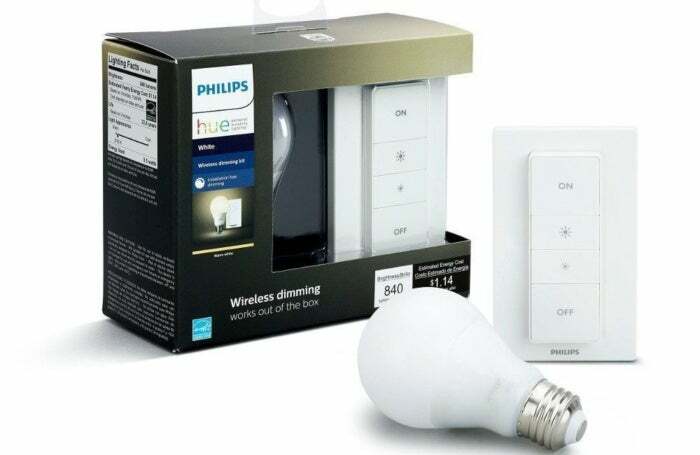 The Philips Hue Smart Dimming Kit also requires a hub, but once you set one up you’ll have even more lighting control. The dimmer kit comes with one Hue white LED bulb to get you started. Once connected, you’ll be able to use the switch as a remote control to adjust the brightness of all your Hue bulbs—up to 10 at a time. This kit has 4.5 stars out of 5 over nearly 250 user reviews on Amazon, with reviewers noting it as a perfect companion to Hue lights. We gave it 3.5 stars, noting its convenience and control as reasons to buy. For even more lighting options, check out our roundup of the best smart bulbs for your home.